Sam A. Cabral was re-elected as the International President of I.U.P.A. in August of 2016. 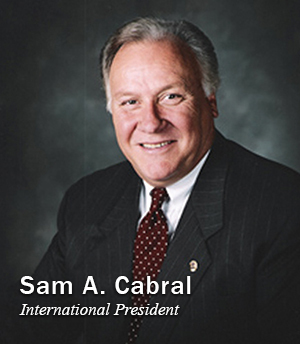 President Cabral began his law enforcement career with the Defiance, Ohio Police Department in 1965 and he retired in 1991 as a Detective Sergeant in charge of the Defiance Detective’s Bureau. In 1988, Sam was elected as the International Vice President of I.U.P.A. 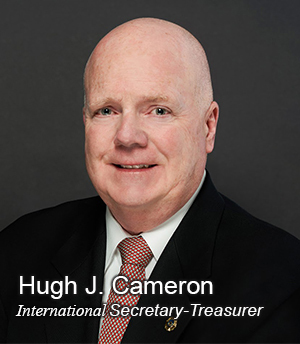 In 1990, he was elected as the International Secretary-Treasurer. He has served as the International President of I.U.P.A. since 1995. As the International President, Cabral leads the only union that exclusively represents rank and file law enforcement officers, EMS workers, and corrections officers in the United States, Canada, U.S. Virgin Islands and Puerto Rico . Sam’s law enforcement and labor background began when his peers elected him as the Chief Union Steward at Campbell Soup for four years before joining the police force. After joining the force, he affiliated the Defiance Police Officers with I.U.P.A. and became President of Local 166 in 1978. His educational background includes attending Defiance College, University of Toledo where he earned his Criminal Justice Degree. He has studied at the George Meany Center for Labor Studies in Washington, D.C. and is a 1978 graduate of the 113th Session of the National FBI Academy. President Cabral currently serves on the Executive Board of the National Law Enforcement Memorial Fund Association, American Income Life’s Executive Board as well as various federal law enforcement task forces. President Cabral has testified before the United States Congress promoting legislation designed to improve both law enforcement policy and the conditions under which police officers work. He has guided legislation that has directly, or indirectly, affected law enforcement officials, such as being appointed in 1994 to the Congressional Commission on Crime Control, responsible for developing the 1994 Omnibus Crime Bill. In addition, Sam ensures that I.U.P.A. is the front-runner in being the members’ advocate on local, state and federal issues that are important to law enforcement. Many issues that he has fought hard on include an increase in the number of officers available to police departments, the rights of police officers, age discrimination, as well as overtime pay cuts. 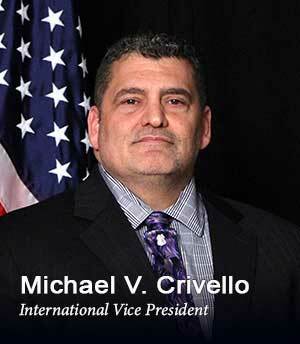 Michael V. Crivello started his law enforcement career in 1986 with USAF Security Police. During his career in the military/National Guard he deployed to over twenty countries. He served at the Pentagon and State Headquarters; he was forward deployed in response to the 9-11 attacks; and retired as a Command Chief Master Sergeant in 2009. Mike Crivello retired from the Milwaukee Police Department after completing greater than twenty-seven years of service [1991-2019]. Throughout his career, he had worked many assignments starting in patrol; was on the ground floor of the creation of the, now, very credible beat/bicycle program; served on a Federal Task Force; performed undercover work in the Vice Control Division; while working in the Sensitive Crime Division, he specialized in crimes against children; he worked various assignments in the Criminal Investigations Bureau; and he also served as an adjunct instructor, specializing in Defense and Arrest Tactics (DAAT). Mike completed his career in the promoted rank of Detective. Mike has been a successful Milwaukee Police Association Steward and Trustee, with an undeniable focus toward membership care. He served as the Union President from 2010-2018. As President, he was the Chair of Bargaining, Executive Committee, Fire & Police Commission relations, Legal Claims, Public Relations & Publications, and an Ex Officio of all other committees. President Crivello was also a registered Lobbyist. With many successes and accomplishments – under his leadership, he maintained collective bargaining for public safety, lifted the salaries of his membership greater than twenty-seven percent, and repealed a seventy-eight year draconian law which prohibited the individual choice of residency – members were finally permitted, by law, to live beyond the limits of the city boundaries. Mike currently serves the members of the I.U.P.A. as the Executive Vice President. As a police officer and union official at various levels, Hugh has dedicated his professional life to bettering the working conditions of his brothers and sisters in law enforcement who protect this great nation. He began his career in law enforcement as a correction officer in 1982. He then became a police officer with the Sharon Police Department in 1984. Hugh was promoted to the rank of Sergeant in 1997. His interest in labor relations began early in his career when he was elected Treasurer of the Sharon Police Association in 1985. After serving the police union in that capacity, Hugh was elected President of that organization in 1988. In 1996, he was elected an Area Vice-President for the Massachusetts Coalition of Police. In 1999, he was elected the President of the Massachusetts Coalition of Police. He has also been appointed to numerous positions throughout his career such as: Vice President of Norfolk County Central Labor Council, Blue Cross Blue Shield Labor Advisory Committee Member, Massachusetts Labor Guild Board Member, Mass. AFL-CIO C.O.P.E. Committee, and he was the very first police officer to be appointed to the Massachusetts AFL-CIO State Federation to provide a voice for those individuals not being heard or represented. During his tenure as President, the Massachusetts Coalition of Police experienced unprecedented growth. When Hugh was elected, the membership was approximately 1377 statewide, with a budget of just under one million dollars. It has become the largest police union in the Commonwealth of Massachusetts, which now has a membership of 4354, 157 locals and an operating budget of 2.6 million dollars, all of which he oversaw. The legal defense coverage has been expanded for every member, a critical incident protocol has been developed and implemented, and the lobbying efforts at the Massachusetts State House and U.S. Congress have been increased, all of which he participated in directly. As President, Hugh organized pickets with many other labor groups to preserve collective bargaining rights, health care, and pensions. He has had the opportunity to organize a number of charity events, including providing Christmas gifts for our military personnel who are staying at the Walter Reed Medical Center. Hugh has also been a constant advocate for Red Shirt Friday to support our troops. What he is most proud of during his career have been his efforts in unifying and educating the many labor groups in Massachusetts and helping them to understand that police officers are proud union members. Hugh also served as Vice-President for the International Union of Police Associations representing Region 12. As a charter organization, the Massachusetts Coalition of Police has been an active member of I.U.P.A. since its inception. With his experience, expertise, and track record, Hugh looks forward to his continued work with President Sam Cabral in bringing the International Union of Police Associations into the future.